On our way to chase this rare Swallow-tailed Kite with a good friend, Mark McShane, disappointingly, we have not had much good luck. But I spotted this tiny lustrous dragonfly that brightened up my day. Dragonfly is a very interesting insect. They have two pairs of transparent wings, three sets of legs and large compound eyes. They mate in the air and often time form a heart shape wheel. Eggs were laid on grassy area near water. Nymphs are hatched after about 2 to 5 weeks and they are aquatic. It could take any where from one to five years with many life cycles for nymphs to climb out of water and emerge themselves into adult form. 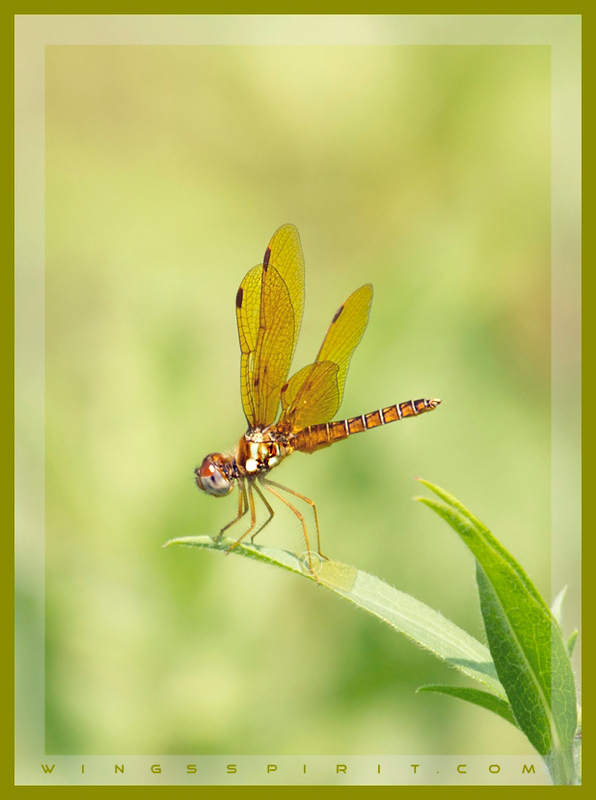 Dragonfly can fly any direction, upwards, downwards, side way or backwards, pretty much like a helicopter. They are predators to mosquitoes, flies and other smaller insects and are no harm to human but they also have many predators, such as birds, frogs and lizards. Adult has a short life span of few months. Note: If you like to chase rare, casual and accidental birds near the southeast region, you definitely don't want to miss Mark's blog, NearGaReport!